Hello, today we’re taking a look at these stunning watch boxes from Aevitas. I’ve actually got number 5 which holds 24 watches and does have a very luxury look to it. I really need to get a second one to be honest. I wanted to showcase the Aevitas watch brand as I’ve used them in the past as I mentioned and I know their watch boxes are high quality and built to last. They have quite the collection of wooden and carbon fibre boxes holding different amounts of watches. I’ve showcased some of their range today however if you follow any of the links you’ll see their whole collection. If for instance you like a certain style, they are likely to have it holding different amounts of watches as well. Anyway, I’ll leave you to have a little look through, hope you enjoy. 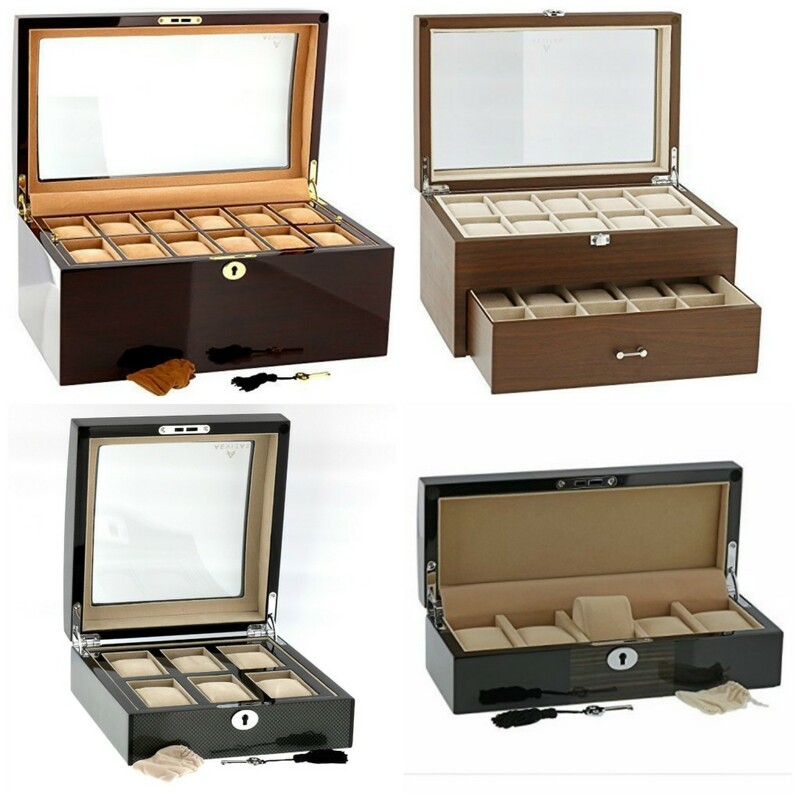 Superb Quality and Design, the luxury look of this Watch & Cufflink box is just perfect. It will hold neatly up to 4 wrist watches in the soft yet firm cushion in the position you set them. Piano Black finish, Glass View through lid with push button catch. Chrome fittings for the modern classic look. 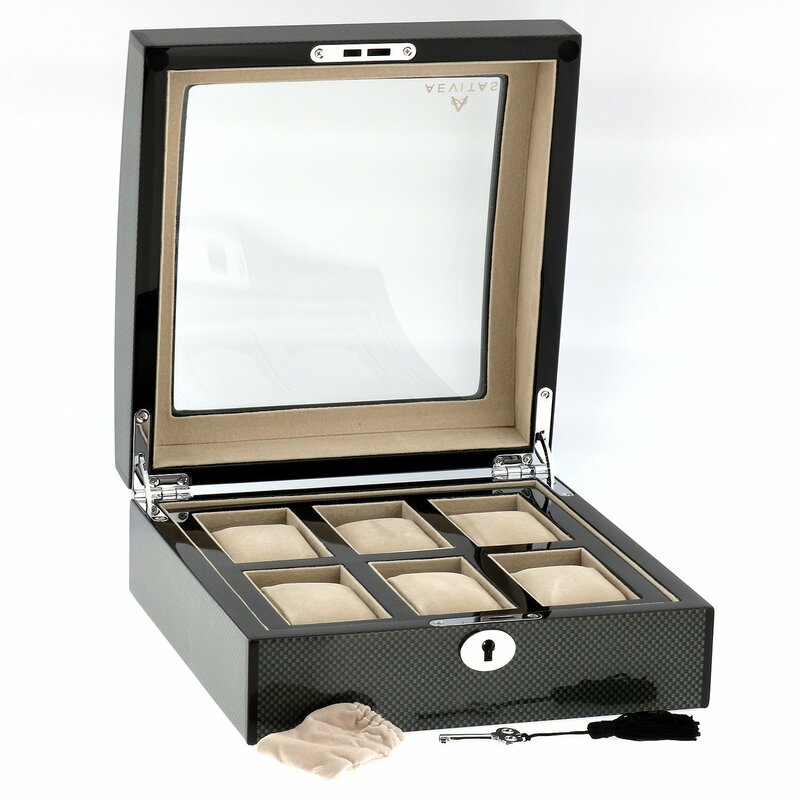 Beautiful high quality watch collector’s box for 5 wrist watches (diameter up to 55 mm), High Gloss lacquered Black with Macassar Veneer Panel plus Chrome Fittings. The inside is decorated with Beige luxury velvet type material to keep the watches stored in perfect condition, softly yet firmly held in place. 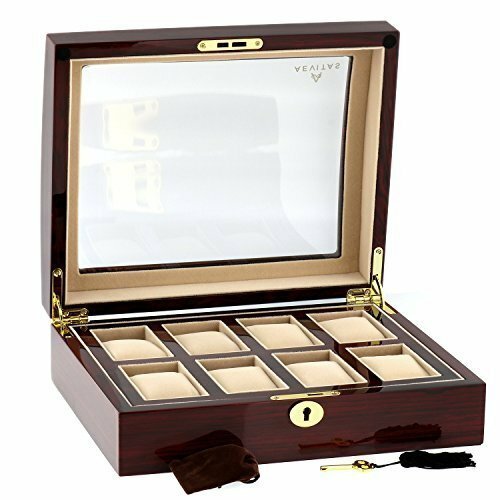 Beautiful high quality watch collector’s box for 6 wrist watches (diameter up to 55 mm), High Gloss lacquered Carbon Fibre Veneer . 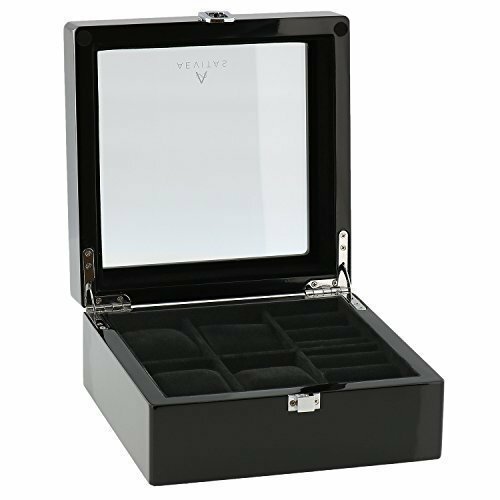 The inside is decorated with luxury Grey velvet type material to keep the watches stored in perfect condition, softly yet firmly held in place. 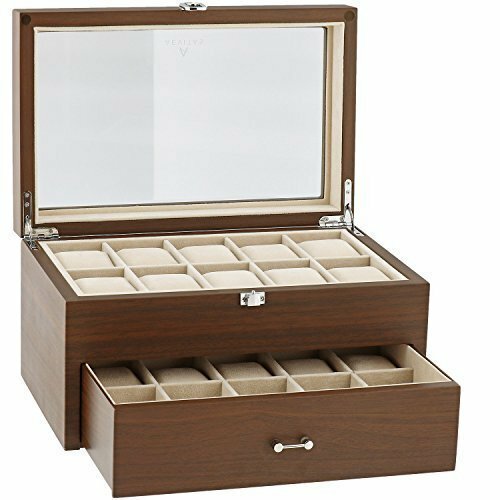 These are the best watch boxes we have for Quality, Design and Value. The exterior is hand finished with 18 layers of clear lacquer. 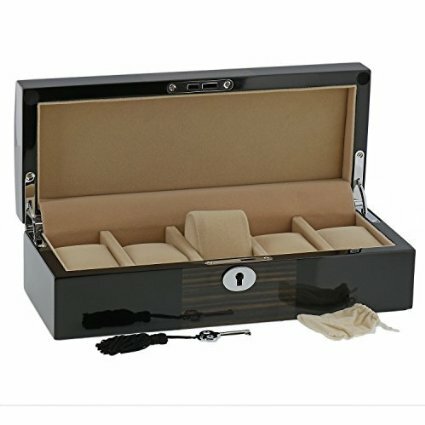 The interior is a Luxury Velvet with 8 snug fitting cushions to hold your watch in the desired position and not move around. Aevitas quality design and finish is Guaranteed to please. 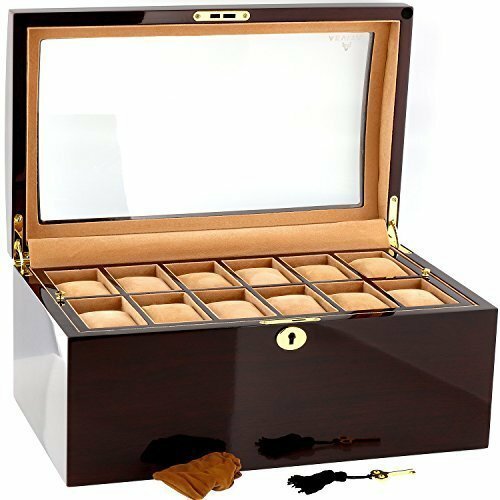 Beautiful high quality watch collector’s box for 24 wrist watches (diameter up to 55 mm), High Gloss lacquered Rosewood Veneer . 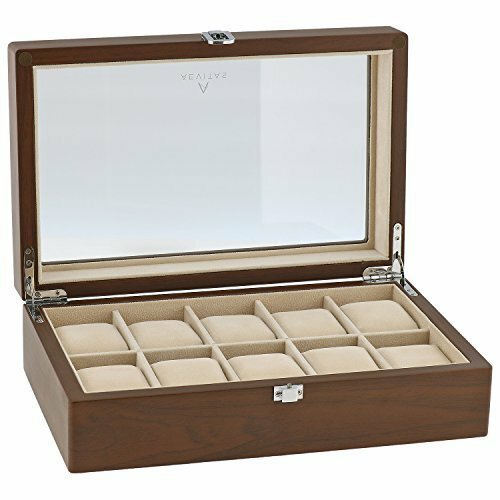 The inside is decorated with Beige luxury velvet type material to keep the watches stored in perfect condition, softly yet firmly held in place. With 2 Lift Out trays so also perfect for storage in a Safe. Superb Quality and Design, the luxury look of this watch box is just perfect. It will hold neatly up to 10 wrist watches in the soft yet firm cushion in the position you set them. Natural Walnut finish, Glass View through lid with push button catch. Chrome fittings for the modern classic look. Superb Quality and Design, the luxury look of this watch box is just perfect. It will hold neatly up to 20 wrist watches in the soft yet firm cushion in the position you set them. Natural Walnut finish, Glass View through lid with push button catch. Chrome fittings for the modern classic look. Thanks for having a read through, hope you found it useful, even just for window shopping they are nice to look at. As I mentioned before I have the 24 holder wooden watch box and love it. I Keep quite a large amount of my watches in it and like to have it on show.